Rubus subspecies (Rosaceae). Deciduous woody perennials, with fruits generally red, but also black, purple or yellow. Raspberries are species belonging to the subgenus Idaeobatus, in which the ripe fruits separate from the receptacle (plug). The species found in separate climates has red fruits and is Rubus idaeus, named after Mount Ida in Asia Minor, the home (according to the Greeks) of the raspberry. The European and North American raspberries are classified respectively into subspecies vulgatus (native to much of Europe and northern Asia to Japan), and subspecies strigosus, which grows wild in North America in the mountains of Georgia to Pennsylvania, through Maine and Dakota to Canada. The North American subspecies is hardier and has brighter coloured fruits than the European subspecies. 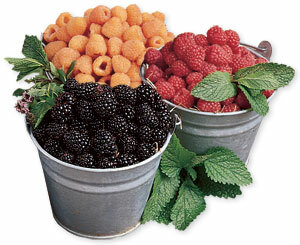 The American black raspberry, Rubus occidentalis, has more or less the same natural range as the American red raspberry, but not so far north and further south. It is less hardy the Rubus idaeus subspecies strigosus. Another black raspberry, of tropical origin, is Rubus albescens, native of the mountains of India, Ceylon, Java and Burma. A selection from it, ‘Mysore’, is grown commercially in Florida and harvested from March to May. Another black tropical raspberry is the Andes berry, Rubus glaucus; this grows at 2000-3000m in central and northern South America, and is cultivated in Ecuador and Colombia. Its flowers are like those of a raspberry, but when picked the fruits retain the plug, like a blackberry, so it may be a hybrid between the two fruits. In Europe domestication of the raspberry was first mentioned by Roman writers in the 4th century, but for a long time they were still generally collected from wild plants. The fruits were eaten or used for flavouring drinks, the leaves for making tea. By the 16th century a number of European writers noted that raspberries were cultivated in gardens, and by the 17th century different forms were described, including those with red, yellow and white fruits, and thornless cultivars. Selection for larger fruits had made considerable progress by the end of the 18th century, and in 1823 the Horticultural Society of London reported that it had 23 cultivars in its collection. Over the next hundred years nurserymen introduced more selections and chance seedlings. In North America, as in Europe, wild forms of raspberries were initially grown. Some European cultivars were introduced to North America at the end of the 18th century and beginning of the 19th century, but they did not flourish in the temperature extremes of the climate. They were, however, effective in combining with Americam forms to produce new cultivars that were an improvement on the North American forms. ‘Cuthbert’, found in 1865, is presumed to be a hybrid of an American and a European raspberry; it was a standard commercial cultivar for nearly 100 years. ‘Willamette’, of which one parent is ‘Lloyd George’, was introduced in 1943 and is still an important cultivar in North America and other parts of the world. The main areas of production in North America are Oregon, Washington and British Colombia, Michigan and New York, and, recently, California. In Europe the main areas of production are eastern Europe and the UK. Most of the fruit grown in eastern Europe goes for processing. The acreage of fresh fruit is increasing as a response to the gradual acceptance of the red raspberry as an all-year-round fruit to the European market, although the European season is lengthening with the introduction of new cultivars, especially ‘Autumn Bliss’ and its relations. Virus diseases became a serious problem for raspberries in the first half of the 20th century, but the work of breeders in both North America and Europe has largely overcome this. The first stage was the production of a cultivar tolerant of virus infection (‘Malling Jewel’), and this was followed by a series of cultivars showing resistance to the aphid vectors of the main raspberry viruses. Sources of resistance to the major pests and diseases are not known. 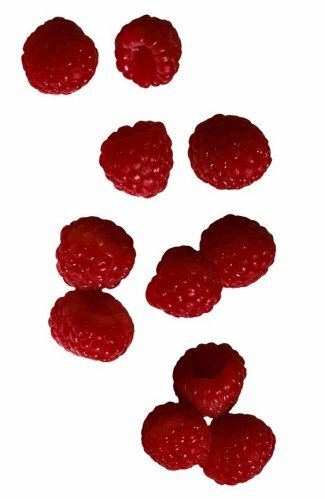 In addition, heavier yields of larger, better-flavoured raspberries have been achieved with the newer cultivars. Autumn-fruiting or primocane raspberries, known for two centuries, have also recently received attention from breeders. These start to fruit in late summer and autumn at the top of the season’s canes, and continue until the first autumn frost. Their advantages are that they can be grown in areas where cold winters may damage the canes, there is less likelihood of a carry-over of pests and diseases, and as the canes are relatively short they do not need a costly support system. Picking costs are, however, higher as fewer fruits are ripe at one time. Cultivars raised earlier in the 20th century are ‘Heritage’ (from New York) and ‘Zeva Herbsternate’ (from Switzerland), neither of which is suited to the short summer of the UK. ‘Heritage’ is widely grown throughout the world. The cultivar ‘Autumn Bliss’, bred at East Malling, with large, early-ripening fruits, shows considerable promise for the UK and other raspberry-growing areas, as does ‘Augusta’ for mid-season to late-season. Other recommended cultivars include: ‘Amity’, ‘Baba’, ‘Durham’, ‘Fallred’, ‘Redwing’, ‘September’ and ‘Southland’. Although yellow-fruited raspberries are not commercially important, thay have been known for centuries: ‘Yellow Antwerp’ was one of the first to be selected and is still available today. ‘Fallgold’, ‘Amber’, ‘Golden Queen’, ‘Golden Nest’ and ‘Honey Queen’ are more recent cultivars. Black raspberries are grown commercially in North America, but are less hardy than the red, and in the UK are susceptible to Phytophthora root rots. Black raspberry fruits have more seeds and are more aromatic than those of red raspberries. ‘Ohio Everbearer’, discovered in 1832, is the best known, fruiting in summer and autumn. Breeding in the US has concentrated in improving yields and hardiness. Among black raspberries grown in the US the following are popular: ‘Black Hawk’, ‘Bristol’, ‘Cumberland’ and ‘Jewel’. Purple raspberries are hybrids of red and black raspberries; they grow more vigorously than blacks and give higher yields. The fruits have a distinctive, aromatic flavour, but consumers usually find the colour unattractive and they are grown commercially in only a limited area in New York State, where some breeding has been done. Purple-fruited cultivars include: ‘Brandywine’, ‘Royalty’ and ‘Success’. Raspberries can be grown in a wide range of climates with careful selection of cultivars, even in northern Canada and Siberia. In warmer climates the canes may not receive sufficient cold during the dormant period to allow bud break in spring. ‘Malling Exploit’ has a relatively low cold reqirement and will crop satisfactorily in a subtropical climate at a suitable altitude. The best raspberries are grown in cool temperate conditions, sheltered from spring frosts and wind. Several modern cultivars have long, fruit-bearing laterals liable to be broken by strong winds. Although originating from a woodland plant, raspberries crop only moderately in shade, but on a north-facing slope in the open they will do well. Canes may suffer winter damage in cold winters, but this is related to depth of dormancy. 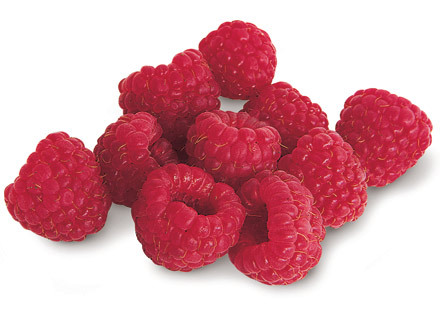 A light or medium loam, deep and well-drained and slightly acid (pH6.0-6.5), is the ideal for raspberries. They do not grow well in heavy soil, but the addition of humus to lighter soils will make these more suitable. The soil moisture content is crucial, and should be adequate to supply water in summer for growing canes and swelling fruit, but not too high in winter to asphyxiate roots. Raspberries will not flourish on calcareous soils, where they may show iron deficiency. Raspberries are self-fertile, so only one cultivar need be planted, unless a succession of ripening fruits is required. In pre-planting soil preparation, remove all perennial weeds and fork into the top 45cm as much organic manure or compost as can be obtained. Buy healthy canes with a good fibrous root system, and if dry soak for 12 hours before planting. Plant during the dormant period, when the soil is not too wet or frozen. Late autumn is usually preferred in temperate climates as the soil may still be warm enough to encourage some root growth: conditions in spring and cold drying winds are often more hazardous. In countries with very cold winters, spring planting is usual to avoid winter losses. Plant the canes with the roots 5-7.5cm deep, and cut back each cane to 20cm, so that they do not fruit in the first year. Autumn-fruiting canes are cut back to ground level. The canes are usually planted at 40cm apart in rows 2m apart. In gardens raspberries are usually grown in upright rows, running north-south for uniform light distribution, with a post and wire support. For red raspberries two wires are fixed at 1-1.5m above the ground and the canes tied to them. An alternative is two parallel sets of wires, 60cm apart, at 1m and 1.5m above the ground, the canes growing up between them; string tied across the parallel wires supports the canes. Commercial growers have developed training methods in which the fruiting canes are held outwards, away from the young canes, which simplifies harvesting, with damage to the young canes less likely during picking. Such systems need wider spacing of rows. Canes of autumn-fruiting raspberries, which are shorter, do not need permanent support. Black and purple raspberries need more space than red, and are planted at 75-120cm apart in rows about 2.5m apart; they are usually grown without support, but a single wire at 45-60cm above the soil supported by posts may be used. Fruiting canes trained on the Lincoln canopy system are tied outwards to five wires on each side of the row; these are fixed at 77cm above the ground and 1.5cm apart. The fruiting laterals hang below the canopy so formed, so are easily picked by the ‘fingers’ of the harvesting machines with relatively little damage. New canes are kept separate from the older canes by a sixth restraining wire up the centre of the row. The system was developed in New Zealand at the Lincoln College of Agriculture. In cold areas such as central United States and eastern Canada, canes are not tied in until the spring in order that the winter snowfall will protect them from very low winter temperatures. Summer-fruiting red raspberries are pruned by cutting off the fruited canes immediately after harvesting, together with any weak canes, to leave about 8-10 canes per metre of row. Any winter-damaged tips are cut out in late winter. Autumn-fruiting raspberries are cut to the ground in winter. New canes of black and purple raspberries are tipped in summer to encourage the growth of laterals; these are then pruned back in spring, according to climate and varietal vigour, to increase fruit size. The old fruited canes are usually cut out each winter. Some growers leave them for four winters before mowing them off. 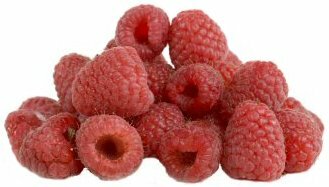 The main nutrients required by raspberries are potassium for fruiting, and nitrogen for cane production. In general, a rate of 15g/m² of sulphate of ammonia applied in spring is sufficient, but for newly planted canes and where growth is poor 30g/m² will be necessary. Too much nitrogen encourages excessive numbers of sappy canes susceptible to winter damage. In midwinter apply potassium as sulphate of potash at 30g/m². Phosphates are needed every third year, applied as superphosphates at 60g/m². A mulch of organic materials, replenished annually, will help to conserve soil moisture content and control weeds. Prunings can be shredded to add to the mulch. Watering will be needed during dry spells; the critical period is as the fruits start to ripen. Apply the water at the base of the plants. Watering in summer is also important for autumn-fruiting raspberries to maintain fruit size and numbers. Weeds are controlled by herbicides, mulching or hoeing, but any soil cultivation must be shallow as the roots grow near the surface. Raspberries are usually grown in clean cultivation, although wide alleys can be grassed down. Recommended cultivars include (red, summer-fruiting) ’Glen Clova’: early; ‘Boyne’: early, very hardy; ‘Titan’: early; ‘Killarney’: early, very hardy; ‘Bulgarsi Rubin’: early; ‘Malling Exploit’: early; ‘Glen Moy’: early; ‘Willamette’: mid-season; ‘Mecker’: mid-season; ‘Newburgh’: mid-season; ‘Schonemann’: late; ‘Dorman Red’: very late; ‘Leo’: very late; (red, autumn-fruiting) ‘Autumn Bliss’: early; ‘Summit’: mid-season; ‘Heritage’: mid-season; (black) ‘Bristol’: early; ‘Scepter’: very late; ‘Munger’: mid-season; (purple) ‘Glencoe’. Pick as fruits when dry, pulling them from the stalk, and keep as cool as possible. They will deteriorate quickly if left in the sun, so some shade is essential after picking, with transport as rapidly as possible to cool conditions (2-4ºC). Machines are used in some areas for harvesting fruit for processing. Machine harvesting of dessert fruit has been successful but it requires an expensive method of training canes (‘Lincoln Canopy’); most fruit for the fresh market is picked by hand. Propagation is vegetative, although seed is used when raising new cultivars. Forking up suckers in the rows is a straightforward method for red raspberries but the canes must be healthy. For large-scale propagation root cuttings are taken. Most countries have a certification scheme for healthy stock. Black and purple raspberries are propagated by tip layering. Pests common to Europe and North America include the bramble leafhopper (Ribautiana tenerrima) with pale yellow-green adults up to 3mm long, causing leaf mottling; the loganberry cane fly (Pegomya rubivora), known as the raspberry cane maggot in the US, with larvae that tunnel in stems causing shoot tips to wilt and snap off; the brown scale (Parthenolecanium corni); capsid bugs; the common froghopper (Philaenus spumarius) known as the meadow spittlebug in the US; and wingless weevils (Otiorhynchus subspecies) with root-infesting larvae and foliage-feeding adults. The raspberry beetle (Byturus tomentosus) is a serious pest of raspberries, blackberries and loganberries in Europe where it is responsible for ‘maggoty’ fruits; a related species, the raspberry fruitworm (Byturus unicolor), is responsible for similar damage in North America. Other North American pests include a clearwing moth, the raspberry crown borer (Pennitsetia marginata) with soft-bodied, white larvae up to 25mm long that tunnel in the crowns and roots; a longhorn beetle, the raspberry cane borer (Oberea bimaculata), with black slender adults up to 12mm long which girdle the stems causing the shoot tips to wilt and die; and the raspberry sawfly (Monophadnoides geniculatus) with bristly, light green larvae up to 12mm long which feed on the foliage. Further troublesome pests in Europe include the raspberry moth (Lampronia rubiella) with small pink or red caterpillars up to 15mm long which tunnel in stems causing young shoots to shrivel and die; the large raspberry aphid (Aphis idaei); and a gall midge, the raspberry cane midge (Resseliella theobaldi) with small pink or red larvae up to 4mm long which, by feeding in cracks on the canes, keep wounds open and allow fungal infection by cane blight resulting in die-back of the canes. Aphids are the carriers of raspberry virus diseases, but these have become less of a serious problem with the introduction of aphid-resistant cultivars. Raspberry beetle larvae eat the fruits; apply a contact insecticide when the first fruits turn pink, and again two weeks later. Plants infected with virus diseases are worthless and should be burnt. Fungal infections of canes such as spur blight, cane spot and cane blight are controlled by protective application of copper fungicide to the young canes. Iron deficiency, which is shown as irregular yellowing between veins, is corrected by applying iron sprays to plant and soil, and by reducing the soil pH. All information correct at time of publication and open to updates as necessary. No part of this website, or its vectors, may be produced in any shape or form, using any type or design of medium, system, equipment or otherwise without the prior written consensual notice of the Cyberian. Any breach of these requirements will result in the appropriate action. If in doubt, e-mail contact is recommended. Some components of this website were obtained as open-source software and are used in the same non-profit manner on this website.